Vibrant, informative and amusing talks for adults, children, or university students. All are highly illustrated using PowerPoint. I am happy to deliver to large numbers at once. Good blackout is helpful, as all talks are image-heavy. A flipchart and pad are required for the drawing demonstrations. Suitable for: 7 years and above. Duration: 1 hr plus Q&A (with brief drawing demonstration at a flipchart). I talk about how my illustrations are created, from first sketches through to finished artwork, showing how characterisation is developed and how I design the page to add impact and help interpret the text. I explain the different people involved in creating a picture book, look at the roles of author, illustrator, editor, designer and printer. I also talk about some of the hilarious and frustrating effects of foreign markets on the published pictures. Duration: 1.5 hours including Q&A (with brief drawing demonstration at a flipchart). The story of my personal journey as an illustrator: how I got to where I am now, sharing the twists and turns of my career. 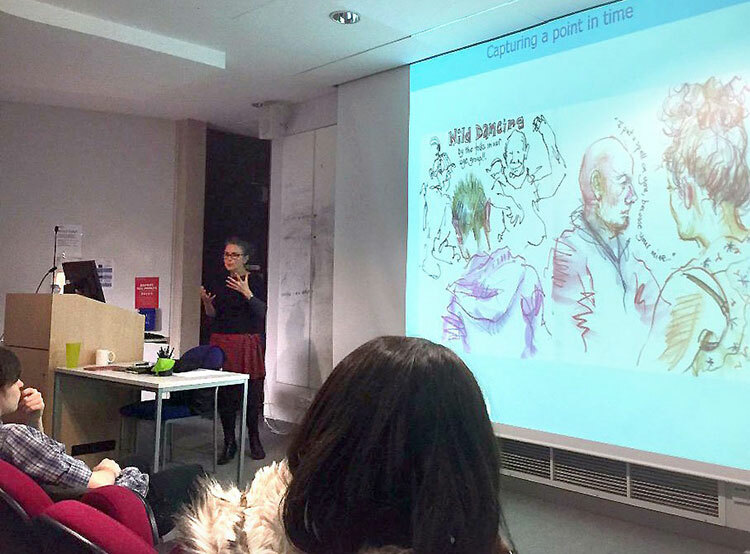 I talk about the different places drawing has taken me, from a degree in Printed Textiles, into editorial illustration, then children’s books and around the world as an Urban Sketcher. I talk in detail about how I create my illustrations and how I use sketchbooks to keep my love of drawing fresh, all these years after turning it into my job. Suitable for: 14 years to adult. Ideal for Art students. NB: I will bring along a selection of different format sketchbooks for people to look at afterwards. An inspirational lecture, talking you through a wide variety of drawings and paintings, all created on location: from everyday sketches of dinner on the stove, or people on a train, to travel sketchbooks from around the world. This talk is bursting with tips about different media and techniques. It looks at interesting methods for using the page, ways to choose your subject and hints to make drawing in public easier. Guaranteed to get your pencil fingers twitching! Can be followed by a practical SketchWalk (add link to Sketchwalk page). Duration: 1 hour 15 mins, including short Q&A. In July 2016, I completed a 10-month project as artist-in-residence at the Morgan Centre for Research into Everyday Lives. I was allowed to draw anything I liked. I sat in on lectures, seminars and tutorials, poked around in professors’ desk drawers, drew in laboratories, ear-wigged student’s conversations… I even painted the washing-up in the communal kitchen. Everything was wound together into 44 concertina sketchbooks, each 2m long. This lecture talks about the experience of collaborating with an academic research team and looks in detail at many of the illustrations I created. I also share some of the fascinating research projects I shadowed. NB: I will bring along some of the original artwork, for people to look at afterwards.